Nothing’s going to stop Darcy playing his guitar! 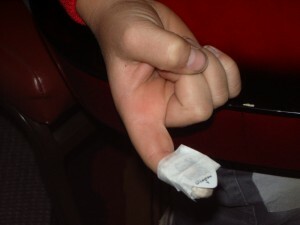 Darcy had a nasty cut to the tip of his right index finger. But a little cut wasn’t going to stop Darcy from coming to his lesson and playing his guitar. 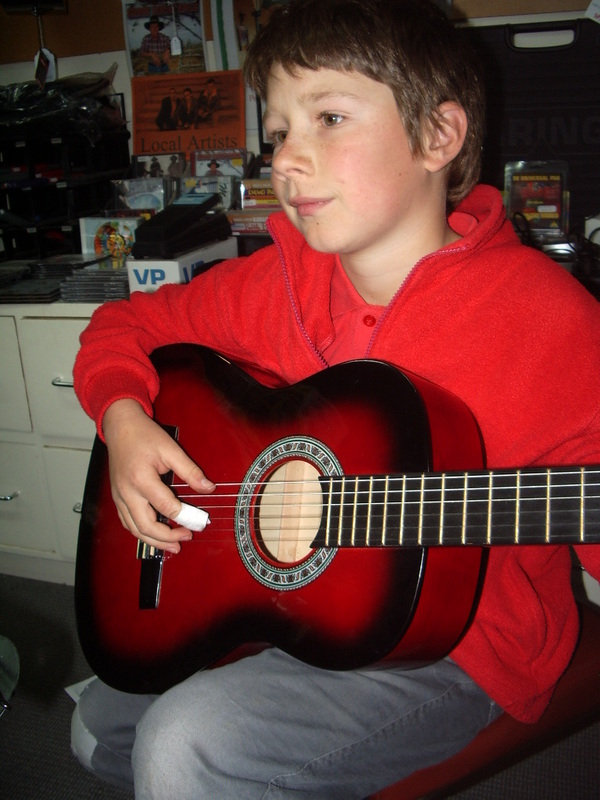 So with a little help from Mum he taped a guitar pick to his index finger so he could still play his classical guitar pieces. How’s that for determination and ingenuity? This entry was posted in Our Students and tagged our students, students on May 24, 2009 by allan. 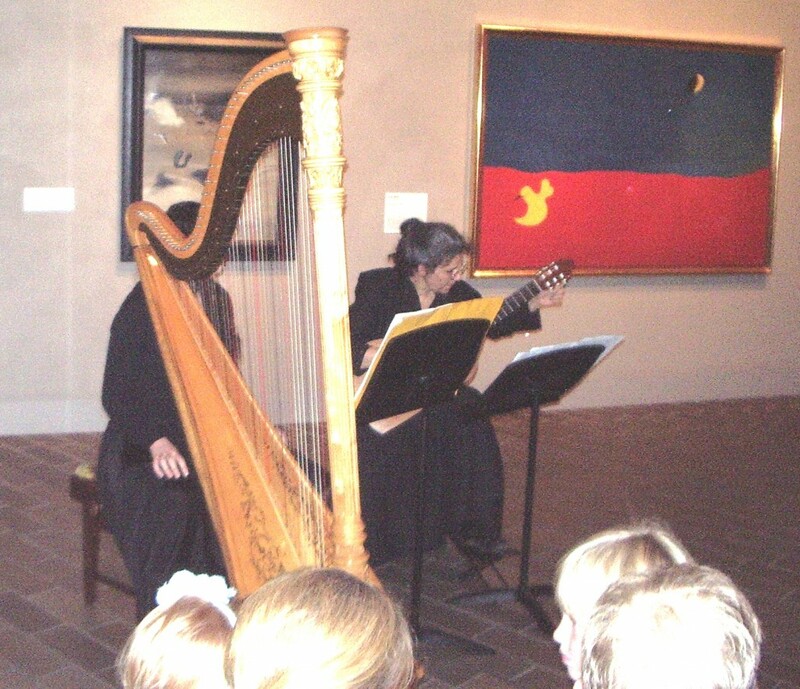 Leslie and Kit Spencer performed together at the National Gallery of Australia as part of the 15th Canberra International Music Festival. Kit Spencer is a lovely harpist and her mother, clinic Leslie accompanied her on guitar. They performed a duet by Felui Gasul de Altisent. 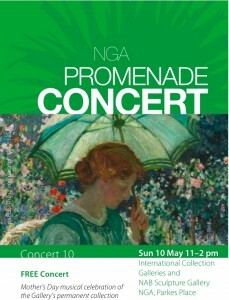 The event was billed as “NGA Promenade Concert”. It featured groups of musicians performing in various spaces around the Gallery. The music was selected to reflect the mood and style of the artworks displayed. Leslie and Kit’s piece complimented a painting by the Spanish Catalan artist, site Joan Miró titled “Paysage [Landscape] 1927”. The audience was invited to walk from one performance to the next. It all worked beautifully. What a fantastic idea! Other musicians performing at this concert were: William Barton (Didjeridu) and Delmae Barton (Voice), pharm TinAlley String Quartet, Helane Huulst (Violin), Chris Latham (Violin & Voice), Michael Askill and Synergy Percussion, and Lucy Anderson (Flute). 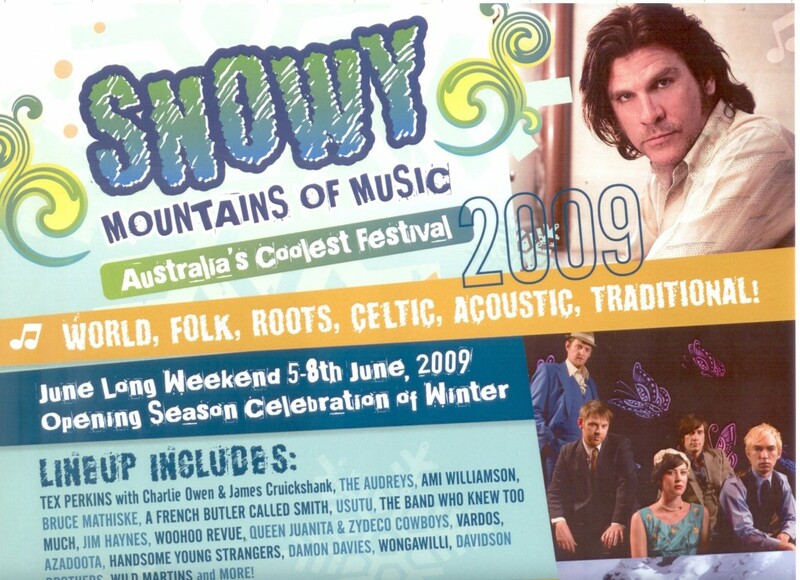 gypsy, folk and guitar at the inaugural Snowy Mountains of Music. 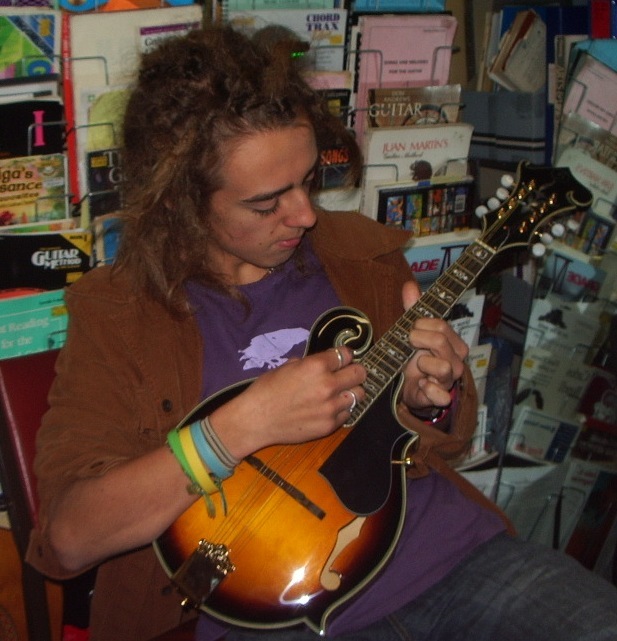 This entry was posted in Music Festivals and tagged folk festival, folk music on May 12, 2009 by allan. 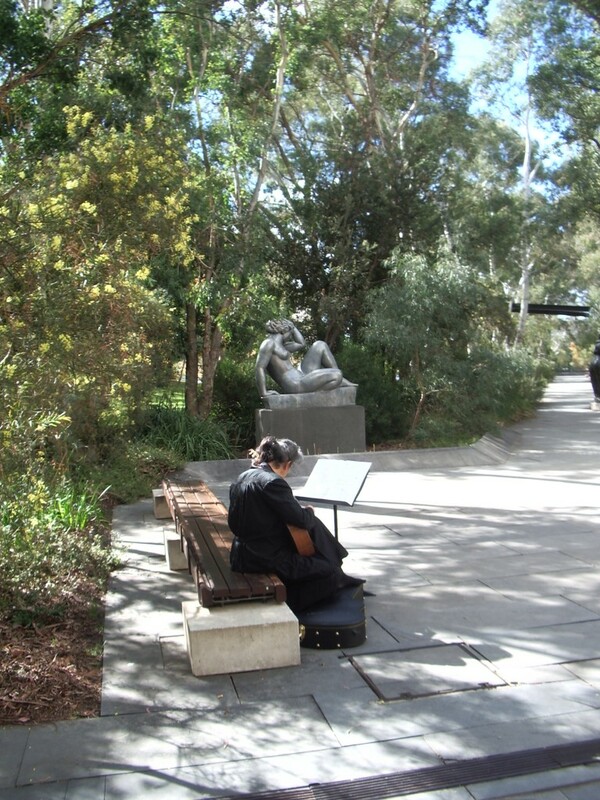 Kit & Leslie perform at the National Gallery of Australia-a very special Mother’s Day! 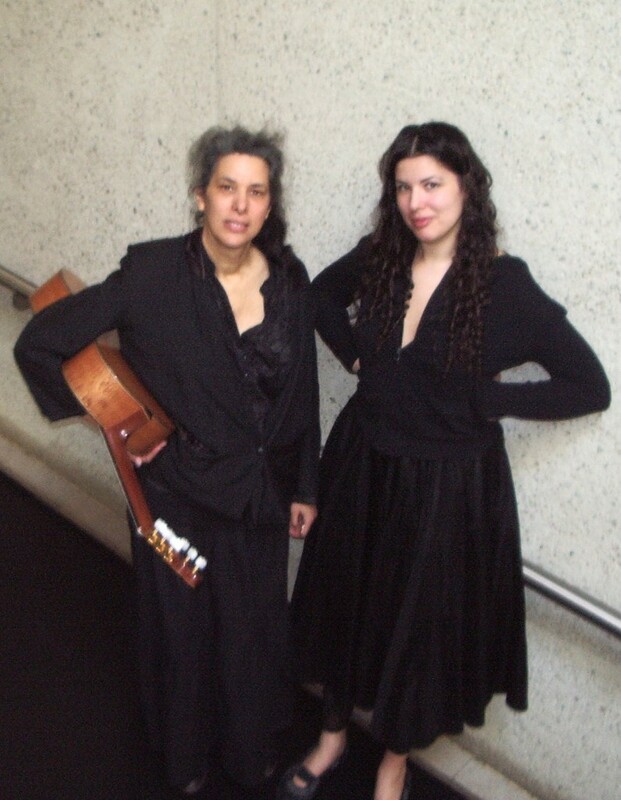 Leslie and Kit Spencer performed together at the National Gallery of Australia as part of the 15th Canberra International Music Festival. Kit Spencer is a lovely harpist and her mother, what is ed Leslie accompanied her on guitar. They performed a duet by Feliu Gasul de Altisent. The event was billed as “NGA Promenade Concert”. 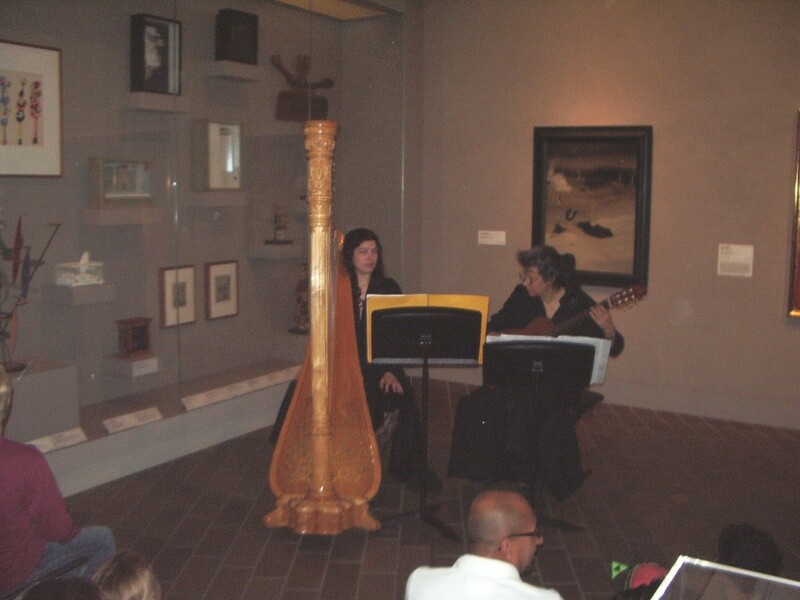 It featured groups of musicians performing in various spaces around the Gallery. The music was selected to reflect the mood and style of the artworks displayed. Leslie and Kit’s piece complimented a painting by the Spanish Catalan artist, cialis Joan Miró titled “Paysage [Landscape] 1927”. Other musicians performing at this concert were: William Barton (Didjeridu) and Delmae Barton (Voice), TinAlley String Quartet, Helane Huulst (Violin), Chris Latham (Violin & Voice), Michael Askill and Synergy Percussion, and Lucy Anderson (Flute). 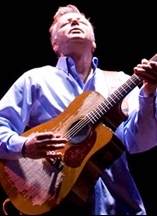 This entry was posted in Concerts & Events and tagged Kit Spencer, Leslie Spencer on May 12, 2009 by allan. Soundcheck.com.au 2009 has been launched! The 2009 competition is now accepting entries! Entry is Free ENTER NOW! a nationwide competition to showcase the most outstanding music programs in Australian Schools. the Music Council of Australia’s national campaign to encourage more music making in schools and communities. This year the judges are looking for schools that SING! Government and independent schools may apply. Awards will be provided to schools in each State and Territory, from which an overall National Winner will be selected. Click here for more information. This entry was posted in Competitions and tagged music competition on May 7, 2009 by allan. This entry was posted in Competitions and tagged music competition, soundcheck on May 7, 2009 by allan.